The 3-day celebration on the occasion of the ’75 Years of MGD’ ended with a car rally. The rally which kicked off from the Albert Hall, proceeded with stops at the Rajasthan University (RU), Jawahar Kala Kendra (JKK), Rambagh Polo Ground and SMS Convention Centre, finishing at the MGD School. At each stop, clues were given to the teams, after solving which, they could proceed further. The rally was flagged off in the morning by the Secretary, MGD Girl’s Guild, Mrs. Nirmala Durlabhji. Around 30 vehicles including Car, SUVs and jeeps with catchy posters and girls, some of them wearing MGD T-shirts, painted the town red. 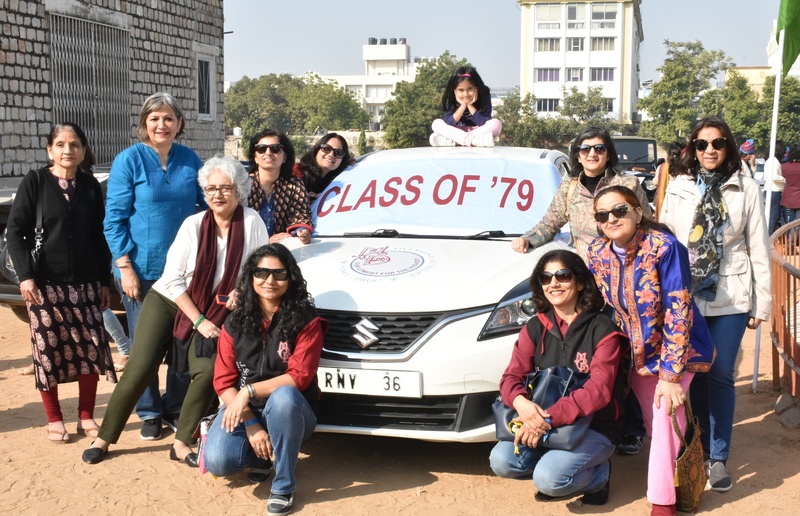 The first position in the rally was bagged by Seema Saraf and team (batch of 1999), followed by Khushbu Saraf and team (batch of 2003) and Vidyut Seth and team (batch of 1989 and 1990) on the second and third positions, respectively. First prize for the Best Decorated Car was won by the girls from 1991 batch and second by 1990 batch. There was also a prize for the Best Sporty Car. The results were decided by a jury comprising the MGD Guild. While Principal, Mrs. Archana S. Mankotia announced the results, they were given away by President, MGD, Rani Vidya Devi.